Kristina, a woman in her late fifties, her tongue loosened by powerful cortisone injections, her memory stirred by the imminence of a dangerous brain operation, tells the story of her life, uncovering bits and pieces of her lifelong-lasting friendship with Anabel, whom she first met in London at the age of eighteen. In 1972 Kristina leaves her harsh but caring family and the farm in Ångermanland in the North of Sweden and goes to London to work as a nanny in a wealthy family, where the two little girls suffer from the emotional coldness of their parents and where money has more value than feelings. Both Kristina and the kids are in fear of the daily supervisions, and Kristina understands that she now belongs to the serving class. It is only when Kristina meets Anabel, the nanny in the flat below, that life lightens a bit. Anabel, daughter of a Welsh miner, is an independent spirit with the ambition of making something of herself. The two young women soon become friends and during the year that Kristina spends in London they help and support each other through almost impossible situations. It brings them close and lays the foundation of a friendship that will come to last for the rest of their lives, despite leading completely different lives in different countries and under very different circumstances. Maria Hamberg was born in 1954 and lives in Ångermanland in the North of Sweden. She has worked as a welder, in an ironworks and on a truck assembly line, but is now a freelance journalist and author. Her debut as a writer was in 2002, her first novel GREKLANDSSOMMAREN / SUMMER IN GREECE was published in 2008 and in 2010 the novel DRÖMFABRIKEN / THE DREAM FACTORY, a collective novel set in a car factory, was released. Both received high praise from reviewers and awarded her the Ivar-Lo Prize in 2012. 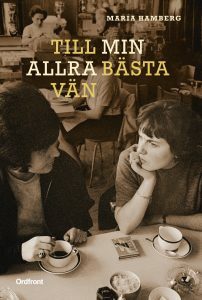 With her first two novels Hamberg established herself as one of the strongest voices within modern Swedish working class literature and an innovator of the genre.